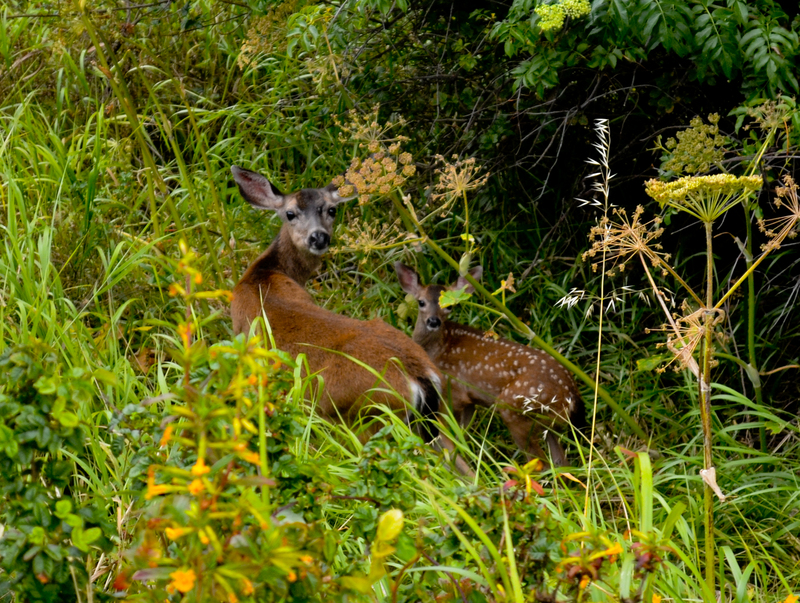 Day 6: Deer in the Spotlight – The San Francisco Bay Trail: It's Closer Than You Think! Pt. San Pedro Road is one I am very familiar with. The last time I was out there I was blowing down these hills at forty miles an hour during the Marin Triathlon – not exactly a stop and smell the roses pace. This was also the last time I actually followed advice coming from a loud speaker. The advice was this – do NOT swim for the first buoy – aim about 100 yards south. As I watched half a dozen professional triathletes miss the buoy and suffer a DNF (DID NOT FINISH), I thought maybe this guy knows his stuff. Not even a pro can outswim a six knot tide. A DNF is never fun and it is something that is always in the back of my mind as I trek the Bay Trail wondering every step of the way “How much is too much?” Should I push for fifteen miles today or stick to my self-imposed max of twelve? Endurance events are tests and one person’s 10K is another person’s marathon. The next time you set out on a trek, make sure you know your limits, bring plenty of water, an apple or two and some energy bars. Then put your smart phone on mute, put one foot in front of the other and don’t forget to stop every now and then and take it all in. Today I decided to push for fifteen miles, however I was greeted at mile twelve with a voicemail from reporter Mike Sugarman of KPIX TV. He was in San Rafael trying to track me down for a story on the Bay Trail that aired tonight http://sanfrancisco.cbslocal.com/video/8962788-hiker-circumnavigating-bay-area-on-bay-trail/ . I called him back immediately and ten minutes later we were meeting in the Marin Civic Center parking lot. This was great! I was going to get an hour break before pushing on to John McInnis Park! Seriously, being able to help the Bay Trail and Clipper get this attention was awesome. I had the opportunity to be on film once before. During a political science class in college when former presidential candidate John Anderson came in with a camera crew in tow, I tried to come up with an intelligent question and when the lights went on and my mouth opened, what came out made no sense and he just looked at me in awe before making up an answer to a question I did not ask. I was hoping this time would be different. In fact, it was. Mike Sugarman immediately put me at ease and we had a great time filming the segment. However there were twelve miles of Bay Trail between my scan-ride-walk commute and arrival at Marin Civic Center. It was different than the prior treks. I had several options of either walking along Pt. San Pedro Road, using the Shoreline Trail, venturing down to McNears Beach or exploring a myriad of other trails between the road and water. The Shoreline Trail actually rises up the side of the hill, bobbing and weaving through dense growths of oak trees. I ventured up a switchback and into the hillside forest above China Camp State Park shrimp fishing village, about six miles from downtown San Rafael. It was a welcome change of scenery and I made every attempt to be aware of every sight and sound that tingled my senses. That attempt proved fruitful as I was greeted by a couple of wild turkeys about twenty feet down the hill from me – too dark for photos but not too dark to appreciate their splendid beauty and shiny coats of dark feathers fitting tightly over their muscular frames like spandex on Colin Kaepernick. A few minutes later my peripheral vision caught some movement among some low trees and brush just below me. A doe and her fawn were enjoying breakfast. We exchanged glances, I said hello (seriously, I actually said “hello”). I shot a few frames then sat back and watched them watch me. Then, without much ado, they simply began eating again. No bounding off into the brush. Just quiet nibbling and going about their business. Once back on Pt. San Pedro Road I came across a rafter of turkeys a hundred yards or so off the road. It was quite a sight as the tom stood still while fanning his feathers for a half dozen hens that seemed to care less about his very existence. After Mike Sugarman and I finished up filming his segment for the six o’clock news, I made my way to John McInnis State Park but stopped short of venturing in for more wildlife. I was already at fifteen miles and couldn’t possibly top what I had already experienced today. I made my way to the Marin Transit bus stop at Smith Ranch Road and Yosemite Drive to catch what is actually a small shuttle-like van. Marin Transit does not accept Clipper as of this writing so make sure you have $2 on hand if you choose to utilize this service. I highly recommend it. Barton, my driver, was very friendly and the trip back to San Rafael, while a bit meandering, felt more like a tour of every part of Marin I have never seen than a bus ride. Before I knew it I was back in San Rafael boarding the Golden Gate Transit 101 Express and was at Lombard and Fillmore twenty minutes later. My pooch, Oscar Wilde, greeted me with enthusiasm as I came in the front door, however, Rob at Who Let The Dogs Out must have really run him around today because within five minutes he was back on his pillow. With three hundred photos to edit I couldn’t afford the same luxury.